With panels on virtual reality, hacking, drone legislation, astrobiology, the future of science fiction, and high voltage toy making, there are plenty of good reasons for the Georgia Tech community to visit Dragon Con. In fact, it's hard not to bump into faculty, students, staff, or alumni there. But they're not only waiting in line to listen to their favorite voice actor or author discuss pop culture -- this year, Georgia Tech led the conversation on several panels. Ben Jacobs, a research scientist for AMAC Reseach Center, represented the College of Design during the "Accessibility Features in Video Games" panel and the "Demo: Game Accessibility Hardware" panel. "There's really this culture of acceptance at Dragon Con," Jacobs said. "Georgia Tech shares that acceptance and understanding that a diverse community benefits as a whole because everyone has something different to offer. Our 'nerd' or 'geek' community really seems to be accepting of people with differences. Regardless of abilities or physical attributes, everyone has something to offer." 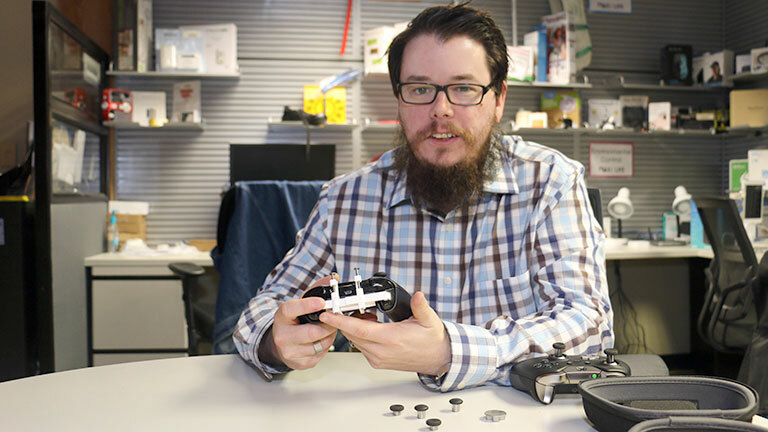 Jacobs, who sees himself as a nerd, is passionate about inclusion in gaming. "You can't tell someone is color blind just by looking at them. That's a real obstacle when playing a (video) game. There are so many invisible disabilities out there," he said. Thankfully, Jacobs could discuss many recent accessibility hardware developments at this year's panel. "'Halo Wars 2' has voice chat transcription," he said. "For the deaf community that's really amazing, and Microsoft says they are thinking about making this feature console-wide in the future." "And the wireless controller from the Xbox One Elite has a modular design, meaning the thumbsticks can be swapped out with a higher profile thumbstick that's easier to use for someone with a disability to use. They're magnetically attached." "Another thing is multi-site control. If someone has the ability to use their right hand and not their left, but they're dexterous with one of their feet, they could access the game using two controllers, one in their hand and one with their foot." Music Technology student Connor Greene had a busy schedule during this year's Dragon Con because he was preparing to play with the marching band at Georgia Tech's first football game of the season. But he made a point to watch the annual Dragon Con parade and visit the booths and panels of a few voice actors. "In mine and many other students' cases, our field of study can be seen in very nontraditional applications such as game programming, or sound design for any number of live-action, animated, or gaming projects," Greene said. "My earliest interests and hobbies have always been centered around voice-over work and performance. Before coming to Tech, I had to make the decision to either go to school to focus on voice acting performance, or a STEM field. I chose Tech, but going into my third year I got to combine my former passion with my STEM and research studies by transferring into the newly created Bachelor of Science in Music Technology program." Living in Atlanta and being so close to Dragon Con is another benefit of attending Georgia Tech, he said. "(Dragon Con) just inherently attracts Georgia Tech students. We can walk down the street to a nationally recognized Con." 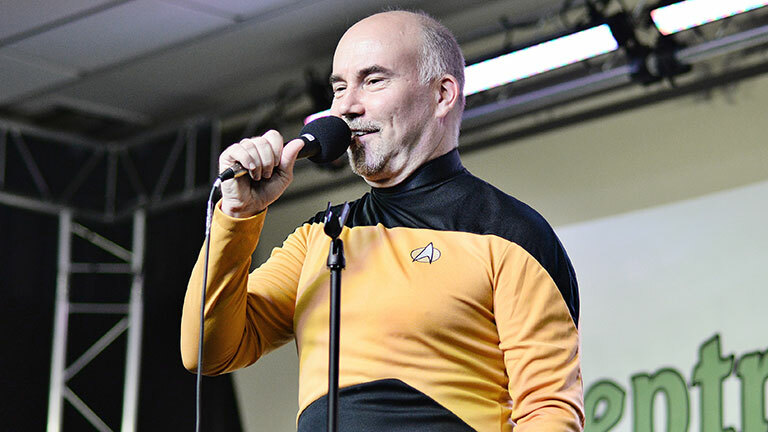 Green said he saw some of his favorite voice actors at this year's Dragon Con, including Rob Paulsen, Charles Martinet, and Michael Rosenbaum. "Rosenbaum voiced 'The Flash' in the Bruce Tim-animated 'Justice League' series, as well as Lex Luthor in the CW show 'Smallville," and Paulsen and Martinet are defining voice roles in cartoons and video games," he said. For School of Industrial Design senior Courtney Allen, Dragon Con was the perfect end to her summer project with the Interactive Product Development Lab. 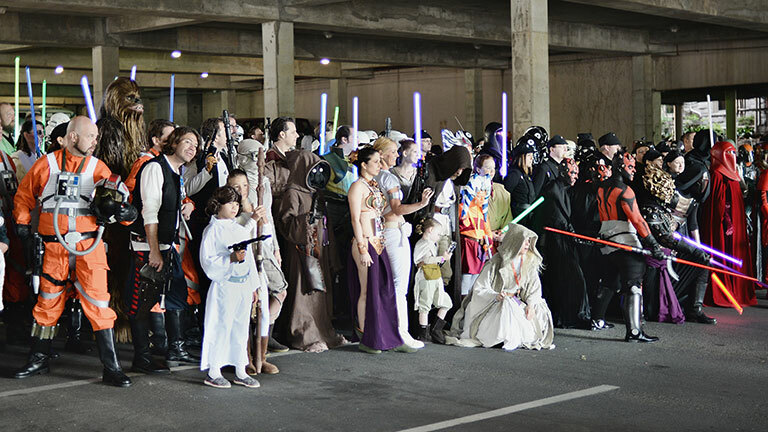 "Every Dragon Con attendee is an expert in their passions and will gladly support others for trying their hardest. Because of the positive and outgoing environment, criticism is given sincerely and encouragingly," she said. 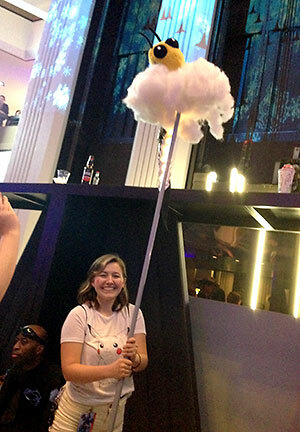 This year, Allen rebuilt Buzzra, the interactive Buzz doll dressed as a dragon, which serves as a visual landmark for impromptu Georgia Tech meetups at Dragon Con. "With the rebuild of Buzzra, I wanted to officially make him a tradition that happens every year," she said. "I also wanted to make sure he was evolving from his past generations. In the past he’s been a totem for Georgia Tech attendees to corral around, having honey-comb patterns, LEDs that gather attention, and even vapor smoke to make him more dragon-like! I knew that he must stay true to Georgia Tech and keep the traditional old gold and white colors, honey-comb influences, and bright LEDs." Allen made Buzzra into an object Dragon Con attendees could hold in their hands like a pet, but could also be placed on a platform and held aloft for visibility. "I learned that Buzzra is this great, iconic product that lets Dragon Con attendees from Georgia Tech -- even though they're strangers to one another -- bond with each other. Georgia Tech students were repeatedly approaching BuzzRa, excited to see their mascot enjoying the same passion that they were. It was exciting to see how BuzzRa brought a piece of home and comfort to an event that is so intense and at times overwhelming." Again this year, the Georgia Tech community was able to stack their Dragon Con schedule with Tech-led panels thanks to the efforts of the GT@DragonCon Facebook group. Faculty, students, and alumni were especially active in the Science and Skeptics tracks. The College of Engineering and School of Electrical and Computer Engineering reported on the sights and memorable experiences of their family this year. The College of Sciences promoted a Dragon Con panel of their own, featuring experts from Astrobiology and friends from Ivan Allen College.